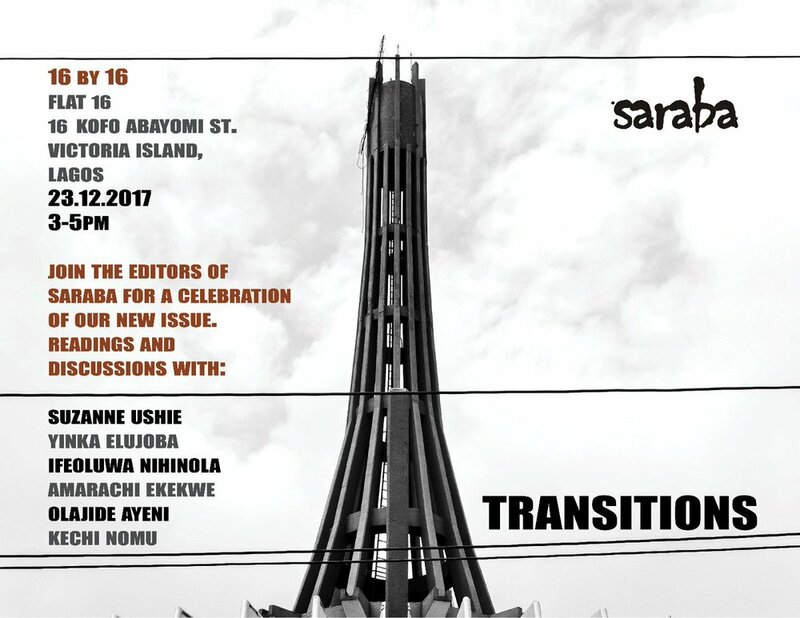 "Join the editors of Saraba for a celebration of our new issue, “Transitions”. The featured writers and visual artists explore the theme of transitions through questions of time, movement, and exchange, among others. Featuring readings by contributors — Suzanne Ushie, Yinka Elujoba, Ifeoluwa Nihinola, Amarachi Ekekwe, Kechi Nomu, Ayeni Olajide — and a discussion of the work and future of the magazine with editors Emmanuel Iduma and Dami Ajayi." Where: 16 by 16—Flat 16, 16 Kofo Abayomi Street, VI, Lagos. When: Saturday December 23, 2017 from 3pm-5pm.